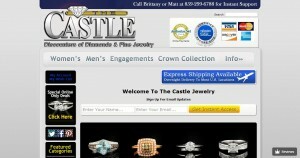 The Castle Jewelry address, phone, website, hours of operation, and more. Our dedicated team of jewelry experts are here for you to answer any of your questions, consider your offers, help find affordable gifts and handle requests for new jewelry to add to our site. We are here for live support Monday-Saturday 9am-4pm by phone at 859-299-6788. You can email us anytime and we will respond as soon as possible, catch us within the live support window and we can typically provide same day response to emails! In addition to our team of jewelry experts we also have a skilled team of jewelers to handle repairs, sizing and questions in our store, this means fast repairs and sizing. Many jewelry stores have to ship your jewelry to another location, we can provide same day service in most cases depending on how early you come into our stores. If you are in Lexington, be sure to take advantages of the amazing prices and offers we can provide.